Mimsy: An iPad app for simple podcasting: does it exist? An iPad app for simple podcasting: does it exist? I’ve been trying to set up an easy way of liveblogging—blogging on the road, from a conference or convention, or just when I see something I want to photograph and blog about. The kicker is that I wanted to be able to write the post whether I’m online or offline. When I sat down to think about the best way of handling it was to use email. While it’s possible to write some complicated HTML5 application, all I really want is to send some text and photos to my blog and have them post. Email will do this: I can write it whenever I want, and as soon as the iPad gets onto a network, it will send the mail(s). Writing the software for handling incoming photos has been relatively easy: the iPad comes with a built in camera app that can easily email one or more photos using the standard e-mail software on the iPad, so all I had to do was grab the emails as they came in. While I’m not a huge fan of audio podcasting—I prefer reading—I thought it ought to be easy to do the same for recorded audio. Technically, it’s just as easy to grab audio from an email as it is to grab photos, and the iPad can record audio. As long as it comes in a standard, small format like mp3, it should be a snap. Unfortunately, there’s no built-in app for that. There’s no built-in app for any audio recording, and if there was it probably wouldn’t handle mp3. GarageBand is great for making mp3 podcasts on the Mac, but the iPad GarageBand doesn’t support mp3. It only supports AAC. I looked for hours on the web and directly on the iTunes app store, and I found nothing that could handle those three requirements: mp3, email, using the iPad’s built-in email app. The two closest were VR+ and Smart Recorder. Both VR+ and Smart Recorder come in “Lite” free versions, so if you feel like you need them, I recommend trying the free one first. Initially, despite its shortcomings, I leaned toward VR+ from SHAPE Services. It emails the files as mp3 files. Unfortunately, it’s also not only not ready for the iPad yet, it doesn’t use the built-in email app. I thought I could live without those features, but the combination meant it was a real pain to send a simple email. It doesn’t use the address book for autocomplete when emailing attachments. This means having to type out the long address that I use for sending blog posts to—a short address would mean spam. The ability to put the address in the address book is one of the reasons I was able to create this system, but VR+ doesn’t autocomplete from the address book. There is no feedback telling you you are being heard while recording: no bar or needle or even pulsing light responding to incoming audio. This turns out to be a bigger deal than I expected. Feedback is useful. It is not an iPad app—which means that writing an email is pixellated and cramped, even in 2x mode. And because it doesn’t use the default mail account to send mail, no record of outgoing messages is available in the outgoing mail box. The mail server it does use appears to be very slow at times: it took about three hours for a 40-kilobyte recording to arrive in my inbox the first time I sent it early in the morning, and after four hours I gave up on the second one. It just disappeared—though this may be because I mistyped the address; since there’s no outbox to look in, I can’t be sure. All subsequent sends appeared immediately, so this may be a minor glitch, but this combines with the lack of an outbox makes it difficult to know what is going on. It’s too bad—their IM+ app is quite nice. And all that said, it’s the only app I could find that would actually email an mp3. It also has one other benefit over Smart Recorder: it uses the name of the recording to name the sent file. If VR+ were an iPad app, and it also had a simple choice for increasing compression, it would be just what I need. But it isn’t, and it doesn’t. The free version of VR+ puts a watermark over each recording when the recording is shared; it also shows ads. The pay version is $1.99 as I write this. Smart Recorder comes very close to being what I want. It is a real iPad app. The user interface is a bit odd (the buttons change considerably between screens, even though they do the same thing, record), but when I email an audio file out I get the real iPad mail app, with auto-completing addresses and everything. It can also record in the background, while doing other things, which may end up being useful. Unfortunately, it doesn’t support sending mp3 files. It supports AAC files (m4a and mp4), as well as several other things that end up being too large to use for email (WAV and AIFF are two I recognized), but no mp3. It’s also a bit complicated to set up. There’s a sampling rate for recording, and a different sampling rate for sending, and both will affect the size of the resulting file. Recording at the default sampling rate of 44100 and then setting email to be 8000, resulted in a file that is twice the size of a similar recording recorded with a sampling rate of 22050, and four times the size of a similar recording recorded at 8000; this means it isn’t a good idea to record at high quality and then reduce quality later when exporting. Smart Recorder allows you to rename the recordings, but the recording’s name doesn’t affect the emailed file: the emailed file is always named “Recording”. Because of that, I have a suspicion I’ll be reconsidering VR+. In the long run, nicely-named files may end up being more important than easily-edited emails. 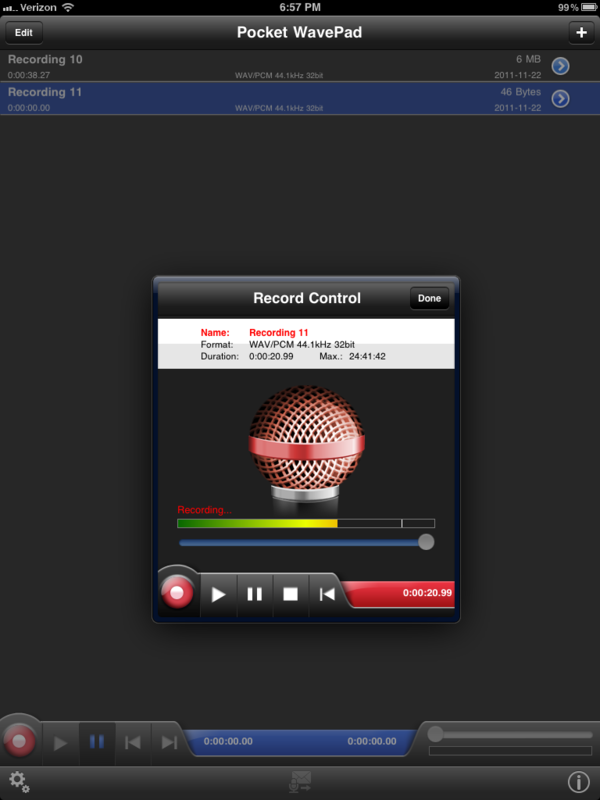 The free version of Smart Recorder limits you to sharing recordings of three minutes or less; it also shows ads. The pay version is $2.99 as I write this. The Mac version of GarageBand is a pretty nice podcast tool. 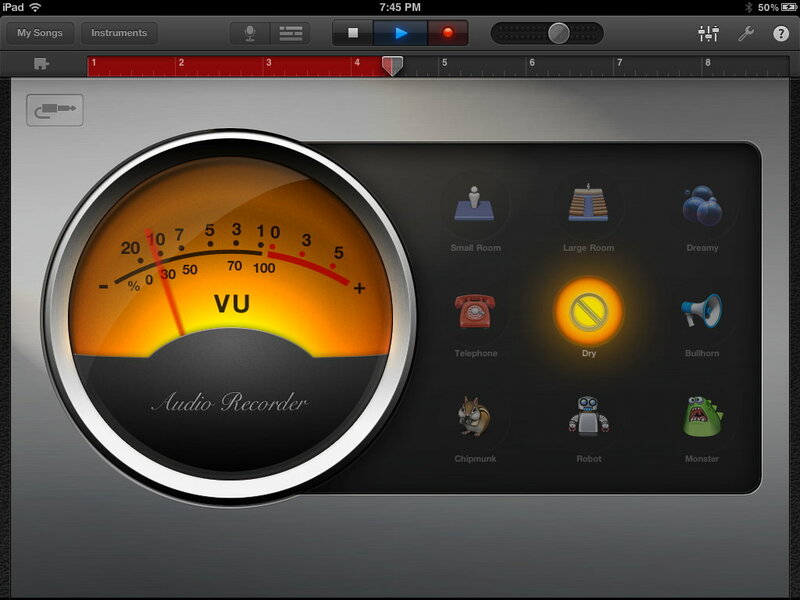 At only $4.99, the GarageBand app isn’t a bad choice either. However, besides not supporting mp3 it also really is designed for music. Every new “song” gets the metronome and count-in turned on. Song section length needs to be set to “Automatic” or it will stop after 8 bars. And it does not display the length of time that the audio has been recording; it displays the number of bars. Its m4a files are fairly large, too. Its version of the 3-minute test ended up being 2549 kilobytes. On the other hand, it does allow for some neat effects, including multiple tracks. Of course, those would make the file even larger. As far as podcasts are concerned, GarageBand is best suited for making audio on the road that you’ll finish up at a workstation. The short answer is, yes. The long answer, maybe not. Now that Firefox no longer supports mp3, every browser except Internet Explorer (version 8, anyway) that supports mp3 also supports mp4. Safari on the Mac, and Google Chrome in Mac and Windows support both mp3 and mp4. Safari in Windows won’t support either mp3 or mp4 without installing Quicktime, and Firefox on either platform doesn’t support either out of the box. So the only browser that really matters is Internet Explorer; it plays mp3 after allowing the Windows Media add-on, but does not play mp4 without installing something extra. Because none of the two apps I looked at support both mp4 and mp3, it’s difficult to make a comparison as far as compression goes. I ran a test at 22050 down-sampled (theoretically) to 8000 on Smart Recorder, and it produced files of similar size: a 3-minute file of me talking on VR+ ended up using 705 kilobytes for the resulting mp3 file; a 3-minute file of me talking on Smart Recorder ended up using 766 kilobytes for an mp4 file and 737 kilobytes for an m4a file. Switching Smart Recorder to record and send with a sampling rate of 8000 resulted in a 3-minute m4a file of 374 kilobytes. The quality seemed to be decent enough for yakking, so that will be my choice for now. It would be great if Smart Recorder could export to mp3 in the future, however, as well as more intelligently name shared files. I just looked at Wavepad again last night; it seems to have everything I want now, plus some: besides recording, as SmartRecorder and VR+ do, it also allows editing, and it allows recording in high quality and then saving a copy in a lower-quality mp3. When I email the mp3 to myself, it has the same filename I saved it as in the app. Judging from the changelog, mp3 support was added in version 4.56 last month, probably right after I downloaded it the first time. Controlling the format and compression rate is much easier on Wavepad than on SmartRecorder. SmartRecorder does have at least one benefit over Wavepad: Wavepad won’t record in the background, but SmartRecorder will. 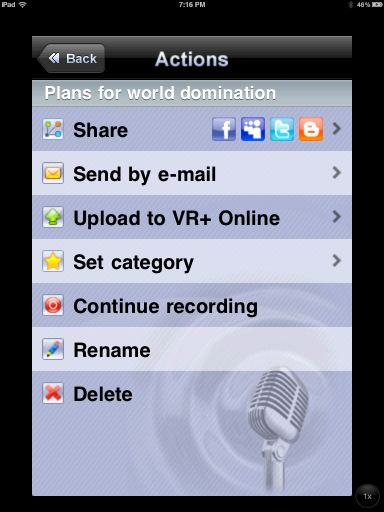 That would make it useful for recording while looking at other apps. It’s not something I’ve used yet, however. Another new feature, judging from the changelog, is that I can record high quality audio, and then have Wavepad automatically encode it to mp3 when I create an email. The editing feature is barebones, but very useful for what I’d be using it for as a blogging app. It even lets you edit multiple recordings at one time, and copy and paste between them. It does have some effects. Most of them are useful effects: silencing a selection, noise reduction, amplification, normalization, etc. But there’s also echo and reverse, too, which is what I’m showing off here. Python and appscript can be used to get email messages out of Apple’s OS X Mail client, and even to get and save attachments. 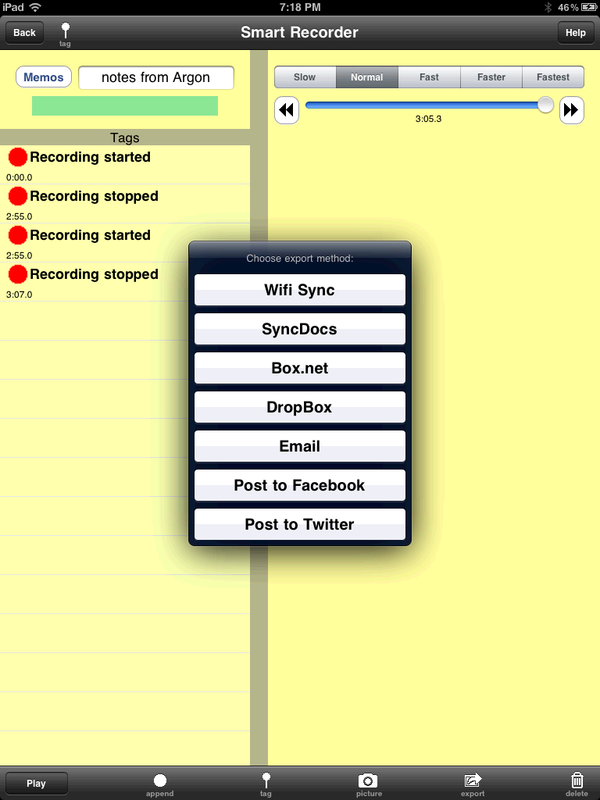 An iPad app for simple podcasting: does it exist? last modified November 23rd, 2011.